Can We Still Save OUR Internet? What is a Social Media Marketer To Do? 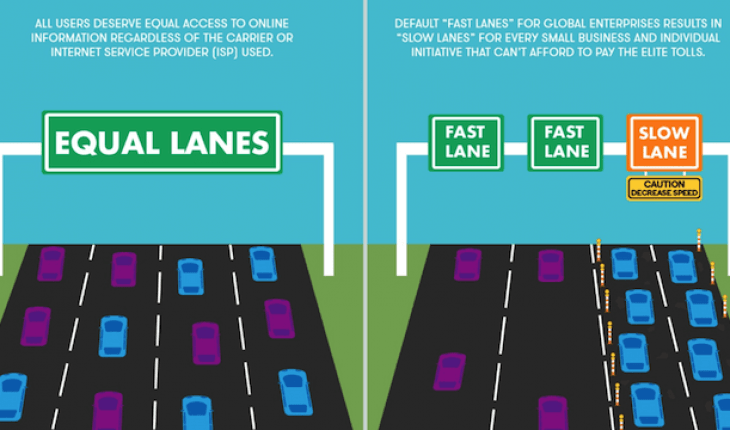 One of the biggest fears of losing Net Neutrality is that ISP’s will split everything into “fast” and “slow” lanes or a variety of different tiered lanes. There’s a strong financial incentive for them to do so. They could significantly boost profits by charging companies more money in exchange for preferential treatment. In this scenario, large companies with big budgets could afford to pay to be put into “fast lanes” where their websites are easier to access and faster to load. That would leave any company or website with a limited budget to be assigned to a “slower” lane where they might also have significantly reduced exposure. This would enable the industry giants to cement their edge over small businesses that can’t afford to pay premiums to the ISP’s. The Internet would no longer stand as a level playing field. Social Media Marketers: Social Media Marketers and businesses across all industries would face a much more difficult landscape to succeed. The large, established businesses would have little incentive to innovate as they could pay to keep their dominant positions with little worry of a new company evolving to disrupt them. This would limit the outlets where Social Media Marketers could find success and further concentrate marketing dollars to a few of the biggest companies. The idea of Net Neutrality has been a catalyst for the birth of small businesses, start-ups, and entrepreneurs which have relied heavily on the open Internet to create markets, reach customers and launch their businesses. It’s fostered innovation, competition, and growth in countless industries. Without Net Neutrality, a new internet company with great potential may never be able to get off the ground. Without the capital to “pay to play” to get their platform in front of the eyes of potential customers or users, many companies that could succeed with an open internet may fail with the un-level playing field. ISPs could exploit their “gatekeeper” position to the point where small businesses have to pay to even be accessible to the public. Any startups looking to get in front of people will struggle and it could squeeze out smaller players completely. Social Media Marketers: If the internet gets more costly and difficult to work with, it’s likely current social media platforms will be leveraged more heavily for marketing. This could have a huge effect on social media advertising costs. Pay-per-click campaigns, promoted/boosted posts, and search results could all become much more competitive and costly as a result. This could make it difficult for any business with a limited marketing budget to find success. There’s also strong speculation that ISP’s will divide internet access into “packages” as this is another way to greatly improve their profits. 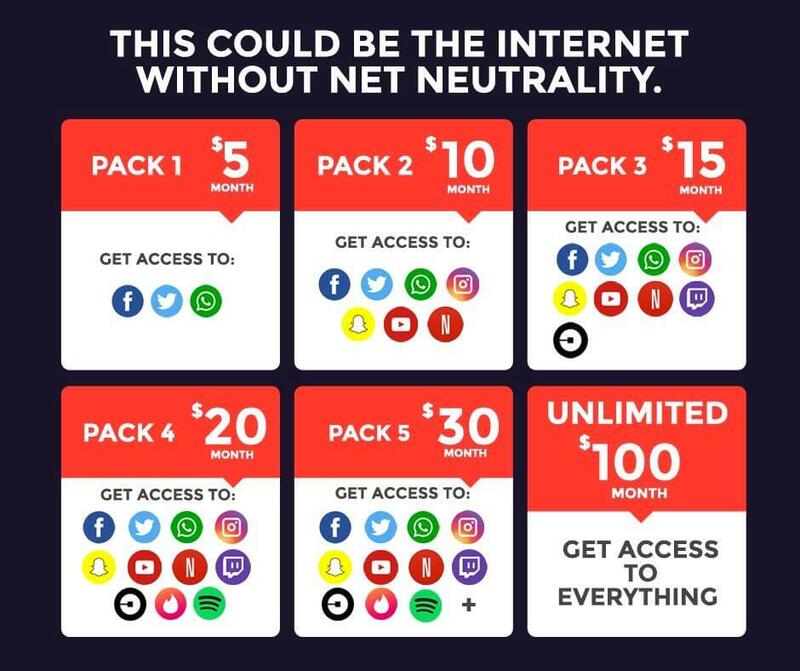 In fact, it’s already beginning to happen in Portugal due to their current lack of Net Neutrality rules. In their case, Internet access has begun to be split into bundles such as “Social” “Video” and “Music”. The direct result of this is the internet in Portugal is becoming segmented. People have restricted access to certain parts of the internet depending on the plans they choose (and which businesses the ISPs have partnered with). Social Media Marketers: Depending on the package a person subscribes to, they may have restricted access to certain social platforms. This restricted access could mean fewer potential leads, customers or visitors for social media marketers. This also raises concerns that certain social platforms may not even be worth marketing toward anymore. Let’s say, for example, Facebook and Google+ make it into all “basic” packages, whereas Twitter, Pinterest, and Snapchat are only included in a higher-cost premium package. The audience sizes on these networks would be dramatically influenced. Some platforms may even “rise from the dead” if they happen to be the ones that partner up with ISP’s. Those who are included in the lowest cost basic packages could gain massive popularity as a result. Social Media may also eventually be divided into regions or by ISP service provider. It’s not difficult to conceive that if Comcast partners with Facebook and AT&T partners with Google+, Comcast subscribers will have easier and faster access to Facebook while AT&T customers will have easier and faster access to G+. That could eventually lead to social media content being determined by which ISP happens to be dominant in your city or region in the US. Another possibility is that ISPs may try to become social media outlets themselves. Since they have more control of where subscribers go, why would they want to send people to Facebook where Facebook earns revenue when they could prioritize sending them to their new social media network where they earn even more money. This could lead to large social media companies buying ISPs or ISPs buying large social media companies. With the ISPs ability to block, throttle and give paid prioritization, it’s likely to drastically change social media marketing. Social Media Marketers: Take, for example, linking. Currently, linking to websites is a core strategy for lead generation using Facebook, Twitter, and other social media platforms. However, if smaller 3rd party websites become less accessible to people who have not subscribed to the “full access” internet package, that completely changes the game. There may be a large increase in built-in blogging tools like Linkedin Pulse with adverse effects on smaller or individual blogs and platforms. This would further strengthen big industry platforms while weakening outside sources and smaller players. This also poses big implications for SEO. Social Media Marketers may decide to stop sharing links to outside websites out of concerns they may be inaccessible to much of their audience. Perhaps this could lead to an overall reduction of traffic to outside websites and even loss of website rankings. 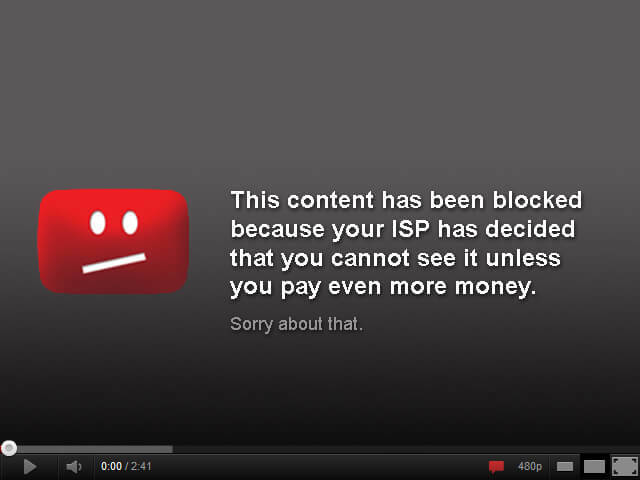 Net Neutrality has not been totally dismantled just yet. 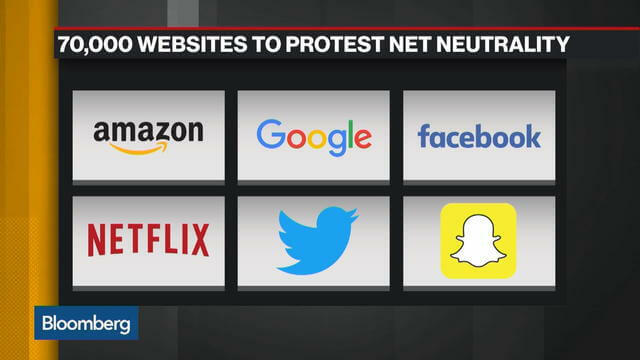 Encouragingly, there are plenty of big corporations which will continue to fight for neutral access to the Internet. After all, the only ones these changes will favor are the ISPs, and everyone else will end up paying them! Thankfully it’s still within the power of the masses to overturn the FCC’s decision to dismantle Net Neutrality using a “resolution of disapproval”. Everyone interested should do their part to fight it and you can urge your lawmakers to do this here. Whatever the final outcome, the winds of change are blowing. It’s up to Social Media Marketers to keep innovating to stay ahead of the game. It’s likely there’s going to be big changes to the way we leverage social media in the coming months and years. But this always opens new opportunities to reach customers. Being aware of these possible changes and how they could shape the Internet of tomorrow will help you evolve your social media marketing to stay ahead in the game. Keep your ears to the ground and be ready to adapt your marketing practices if these speculations start becoming a reality. It’s important to remember that before 2015, Net Neutrality was not regulated. ISPs, for the most part, followed the key principles behind Net Neutrality. (Note: there were a few cases where problems arose — for example this one and this one). 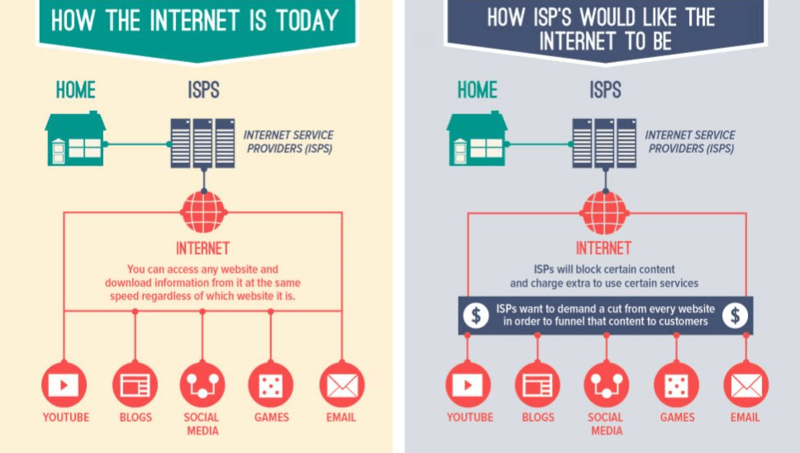 The Internet will not die as a result of these changes, nor will we see big changes overnight. That said, it’s important to keep a close eye on what ISPs do, going forward, as they can make changes that are to their benefit with no oversight, and over time they are likely to test what they can get away with. When so much money is at play, bad things can and often do, happen.